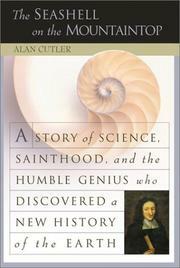 Natural sciences journalist Cutler crafts a solid biography of 17th-century scientific original and restless religious conservative Nicholas Steno. When, in 1668, Steno produced a little 78-page tome that forwarded the idea of superposition (which eventually became the science of stratigraphy) and went a long way toward explaining just how those shells came to be on mountaintops, he was not coming out of nowhere, writes Cutler. He was already renowned for his discoveries as an anatomist and had been invited by Grand Duke Ferdinand de’ Medici to work at his academy in Florence, becoming an important element in the post-Galilean ascendancy of experimentation and direct observation. Cutler explains how Steno fit into an age of intellectual ferment, doubt, and subversiveness, why he let his research follow its own muse, why neither the realm of eternal forms nor spontaneous generation satisfied him as scientific explanations. As well, Cutler settles Steno on the intellectual timeline that made valuable contributions to earth science, including the work of the Pre-Socratics, the Brothers of Purity, Leonardo, Avicenna, Robert Hooke, and John Woodward (who had an unfortunate tendency toward plagiarism). Cutler handles the scientific material with a sure hand and tackles with eagerness the importance of cross-fertilization as much as conflict in the church/science relationship. And though he is treading in the world of intense emotions when it comes to explaining why Steno took a “blind leap into the infinite” by converting to Catholicism, his comments have the ring of truth because Cutler sticks to his subject’s written words and doesn’t parade his own spiritual notions. Steno’s later years—he vowed poverty and self-denial and died in his mid-40s—play out against church corruption and lay indifference, with science a memory seemingly as distant in time as his fossils. Strong portrait of an unsung innovator, an intellectual meteor that struck the world of geology and sent it slowly spinning.